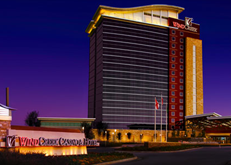 Set off I-65, the modern Wind Creek casino, hotel and entertainment center is 6 miles from downtown Atmore, Alabama. As part of an expansion, the 50,000 property now includes an entertainment complex with a cinema, amphitheater, arcade, and bowling alley. This entry was posted on Friday, March 15th, 2013 at 2:44 pm	and is filed under . You can follow any responses to this entry through the RSS 2.0 feed. Both comments and pings are currently closed.